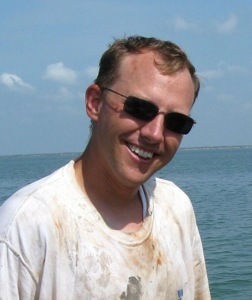 I am a sedimentologist with a broad interest in siliciclastic systems. Most of my work has focused on Quaternary coastal systems and the processes that control their stratigraphic architecture and the environmental history recorded in their deposits. My fieldwork has included everything from multibeam imaging of the Antarctic seafloor to measuring section within the Permian outcrops of Western Oklahoma. However, despite these distractions, I usually return to coring estuaries along coastlines. My research focuses on comparing beach characteristics across the Antarctic Peninsula. I am studying relative sea-level record of the South Shetland Islands, Antarctica. I am using ground-penetrating radar to image raised beach deposits and use their stratigraphic architecture in the creation of sea-level curves on Livingston Island. To date these raised beaches I use optically stimulated luminescence to determine when these beaches were active. My current research focuses on using ground-penetrating radar to image the shallow subsurface in coastal environments, specifically looking at the shoreline response to large sediment input events at deltas. Currently, I am using data collected from the Ventura-Oxnard Coastal Plain, in areas proximal to the Santa Clara River Delta.